The 22 January, 2009, edition of the magazine Le Nouvel Observateur gave wide coverage to Adnan Oktar's scientific study that has totally demolished Darwinism. 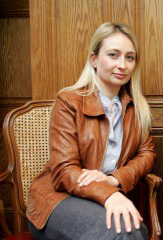 Although the report does contain signs of the psychological warfare techniques employed by the Ergenekon terror organization, it had no alternative but to describe Adnan Oktar’s complete triumph over Darwinism in the face of the reality of that victory. That is because the theory of evolution has been unequivocally defeated in the face of the clear and scientifically irrefutable evidence in Adnan Oktar’s works, and the whole world has witnessed its overthrow. These works have brought about very positive and welcome changes in the ways of thinking of leading statesmen such as Nicholas Sarkozy and Tony Blair, politicians, thinkers and academics. That fact is also stated in the article in question. Below are a few passages from the report that serve as confessions of the defeat suffered by Darwinists. Expressions in the report such as "The greatest Creationist offensive ever,” “Panic in [Darwinist] education,” “Adnan Oktar is the leader of the most influential anti-evolution movement in the Muslim world,” “His deterrent force is impressive,” “terribly effective” and “There has never been such a great anti-Darwinist movement before”, are evidence of Darwinists’ and materialists’ helplessness and despair in the face of Mr. Oktar’s works. Another striking passage in the text reads, "If Creationist ideas are victorious in these lands of laic philosophy, THE STRUGGLE WILL BE WON. HIS GREAT DREAM OF PIOUS EUROPE WILL BE A REALITY...” The laic philosophy referred to here is not, of course, the laicism that respects all beliefs, and espouses freedom of ideas and both believers and atheists being freely able to express their ideas, of the kind supported by Adnan Oktar and all Muslims. What it means is materialist philosophy based on and favoring irreligion and opposed to faith and religious moral values. And what European Darwinists and materialists are really afraid of is the current collapse of materialism that has literally enslaved Europe for the last 150 years and smothered it in darkness. By Allah’s (God’s) leave, with the collapse of Darwinism and materialism, Europe – just as materialists fear – will return to religious moral values in great numbers, and the continent will enter the real age of enlightenment. In January 2007, FRANCE CONFRONTED THE GREATEST CREATIONIST OFFENSIVE EVER ON ITS OWN SOIL. He [ADNAN OKTAR] IS THE LEADER OF THE MOST INFLUENTIAL ANTI-EVOLUTION MOVEMENT IN THE MUSLIM WORLD. 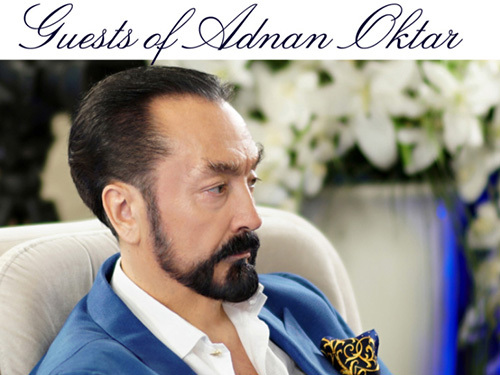 A one-time student of fine arts in tie, [Adnan Oktar] STANDS BEFORE US TODAY AS A WRITER AND MAN OF SCIENCE OF INTERNATIONAL RENOWN. He is serene. He has achieved his aim. HE HAS SET THE WORLD TALKING ABOUT HIM. HE IS CONVINCED THAT HIS “ATLAS” HAS INSPIRED THE SPEECHES ON RELIGION OF THE FRENCH PRESIDENT NICOLAS SARKOZY – WHICH HE DESCRIBES AS “A GOOD BELIEVER” – AND TONY BLAIR’S CONVERSION TO CATHOLICISM. HIS DETERRENT FORCE IS IMPRESSIVE. 71 OF HIS WORKS, including the children’s books “Tell Me about the Creation” and “The World of Our Little Friends, Ants,” HAVE ALREADY BEEN PUBLISHED IN FRENCH. 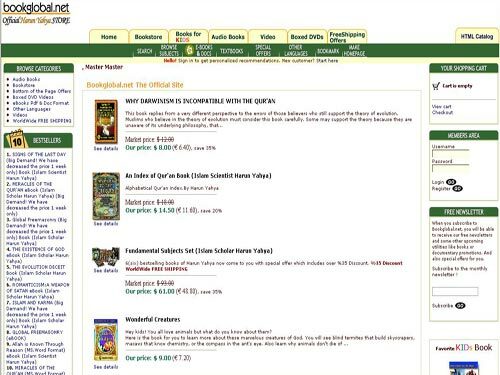 All his books are available on the Orientica.com web site based in Montreal, as well as in some Islamic book shops in districts 11 and 18 in Paris. Tens are also cited on such leading web sites as Amazon.fr or Fnac.com. A TERRIBLY EFFECTIVE machine of propaganda. ACCORDING TO A SURVEY BY THE ACADEMY OF SCIENCES, IT APPEARS THAT 75% OF HIGH SCHOOL STUDENTS IN THE COUNTRY NO LONGER BELIEVE IN THE THEORY OF EVOLUTION. If Creationist ideas are victorious in these lands of laic philosophy, THE STRUGGLE WILL BE WON. HIS GREAT DREAM OF PIOUS EUROPE WILL BE A REALITY... Because, in his own words, the eradication of Darwinism is only the first stage. This is a “psychological bolt” in the population’s consciousness to be cleared away so that it returns to faith again. As in the rest of the world, the people of France have also reached a definite conclusion that Darwinism has collapsed. Various panicky reports revealing the defeat of Darwinism have appeared in several French newspapers and magazines. 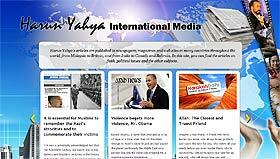 ADNAN OKTAR: Harun Yahya. Harun was Musa’s (a.s.) helper. And Yahya was the helper of the Prophet ‘Isa (a.s.). Because it emphasized the attribute of helping very well. Yes. ADNAN OKTAR: Both were the helpers of great prophets. Harun was the helpmate of Musa, and Yahya of the Prophet ‘Isa (a.s.). I adopted that name in a symbolic sense to emphasize that I want to help the community of Muhammad, in other words those people devoted to him. ADNAN OKTAR: I have been very good natured ever since childhood. I was humane and compassionate. My mother would get tired, for example, and I would stay away from her. She would want to put me on her lap, but I would refuse in order not to tire her. In my high school years... Yes, I started to perform my regular prayers at the end of high school. I won a place at the Fındıklı Academy of Fine Arts, the Department of Interior Design. I came third in the Academy of Fine Arts entrance exam. I embarked on intensive activities when I got there. ADNAN OKTAR: At the end of high school. At the end of high school. I undestood the nature of matter better. I better understood that matter was an image in the brain. Matter does exist on the outside, but we see it in our brains. In other words, we perceive an electric current as an image inside a small piece of flesh. For example, I am watching on a miniature television in my brain. There is a small television screen in my brain, and I watch on that. It shows you as very large. 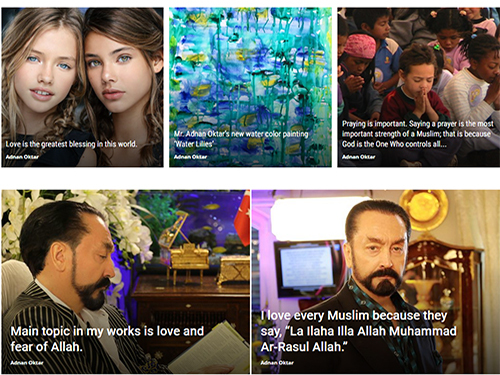 ADNAN OKTAR: I read Said Nursi’s books, the Risale-i Nur collection. I read the Letters of Imam Rabbani. ADNAN OKTAR: I am very fond of Fettullah Gülen. He is also a student of the Light. He also reads Said Nursi’s books. He is a democrat, very moderate and loving. Yes, I admire his ideas, I regard Fettullah Gülen’s thoughts and ideas, his conception of humanity, his conception of democracy, and his embracing and affection toward all humanity as very excellent. ADNAN OKTAR: Yes, I studied at the Fındıklı Academy of Fine Arts from 1979 to 1983. In 1983 I transferred to the Istanbul University Philosophy Department. But there was intensive anarchist terror there at that time, a mad environment. I was forced to leave. I stayed there for a while, but it then became impossible to remain. ADNAN OKTAR: I was put into a mental hospital in ’86. They chained my foot, my left foot. They chained me to my bed. This is something done to dangerous patients. ADNAN OKTAR: I was kept chained up there for 45 days. I was then held there for 10 months. It was full of mental patients with no clothes, hitting their heads everywhere, rolling round on the ground, people who had killed others. Three hundred mental patients. There was a huge ward they were kept in. An old building from the time of Sultan Abdulhamit. I spent 10 months there, with them. ADNAN OKTAR: But the Military Hospital later issued a report saying I was sound in mind and body. But for years they engaged in propaganda saying the author of my books was a lunatic, so as to make people not to read them. ADNAN OKTAR: America, Britain, Denmark, Norway, Sweden, Holland but particularly France. To France, Britain and America most of all. To those three in particular. It has also been distributed in Italy... France was where Darwinism, materialist philosophy and atheism were strongest. The most crucial place. There was really important. ADNAN OKTAR: France is philosophy’s main home. Since it is the most important place that was where we also concentrated our efforts. And we obtained results. It is very good at the moment. ADNAN OKTAR: It is the official philosophy in France. The ideology of the entire system. The French state is constructed upon Darwinism...Therefore, the state inevitably serves atheism...Young people and scientists are kept under pressure by this official ideology. ADNAN OKTAR: I have brought freedom to France. I have enabled them to think freely. I showed them that Darwinism was a hoax, a fraud. People were unaware of the existence of 100 million fossils. There are living fossils. One hundred million fossils, a hundred million pieces of fossil evidence that are identical to living things today. I showed people that these exist. And this really rocked France. ADNAN OKTAR: To eliminate the damage done by Darwinism, because Darwinism lies at the root of anarchy and terror. Darwinism lies at the root of communism, fascism, Satanism and all atheist philosophies. Darwinism currently lies at the root of terrorism today. Destroying Darwinism means the liberation of the world. ADNAN OKTAR: That was a press statement. After that statement Le Monde said that nobody had been expecting him to go that far... As you know, Tony Blair was a socialist and a Darwinist. He has also changed profoundly... He says he reads the Qur’an in the evenings and has given copies to famous artists. ADNAN OKTAR: Of course Islam is the true faith, but Christianity and Judaism are also ancient divine religions, although they have been corrupted. Islam is the true faith. Le Nouvel Observateur: What do you think about Sarkozy? ADNAN OKTAR: I think he is really good, highly intelligent. Insha’Allah all French people will be like him. Le Nouvel Observateur: Do you like what he says about secularism? ADNAN OKTAR: It is most excellent, of course. Secularism brings out genuine Muslims, genuine Christians. Hypocrisy appears in an environment in which there is no secularism. Hypocrites emerge. They begin to say they are Muslims when they are not. But no such thing happens with secularism. Atheists must be free to say they are atheists. ADNAN OKTAR: Our publishing house is well known. I will give you detailed information on that subject, insha’Allah. Yes. ADNAN OKTAR: Their (American creationists) power to explain Creation is very weak. They have also not been influential in Europe. They have never been that influential in America. They have always been weak and in small groups. But my work, and this is what the press says, not my words; for instance, Germany’s Stern magazine speaks of a book ‘Exploding Like Thunder.’ In other words, it has brought Europe down, and that is most significant. Science magazine in the USA speaks of ‘The most eye-catching assault on evolution.’ A newspaper published in Sweden refers to ‘A magnificent work that challenges Darwin.’ The Irish Times newspaper refers to ‘The most extraordinary event so far this year.’ The New York Times speaks of ‘The greatest and best Creationist challenge.’ La Liberation in France says , “It has caused a total panic.’ The French magazine Science et Actualites says ‘The Atlas came as a cold shower.’ Italy’s La Stampa says ‘Farewell Darwin.’ In other words, it is a work that has stunned Europe and demolished Darwinism in Europe. Creationists had no such power before that. The Evangelists had no such power. ADNAN OKTAR: Most Christians are Darwinists. Most Christians in Europe and America are Darwinists. ADNAN OKTAR: Yes, but that stems from the fact that people are religious. Ot herwise, anti-Darwinist consciousness-raising and anti-Darwinist works are not that powerful in America. Their evidence was not that strong, either. For one thing, they say the Earth is only 6,000 years old. So they lose right from the start. No anti-Darwinist activity is possible under such circumstances. The fact is that the Earth dates back to 15 billion years. ADNAN OKTAR: France’s Le Point carried a headline saying, “Save Darwin.” It would not have said that had there not been a profound impact. ADNAN OKTAR: But it is the results that count. Because, for example, the level in Turkey of people not believing in Darwinism currently stands at around 90%. It was the other way around before. In the ‘70s, around 70% of people in Turkey believed in Darwinism. But now 90% do not believe in Darwinism. ADNAN OKTAR: ... The important thing is the existence of a conscious and influential idea, and it is very important for the public to know that Darwinism has collapsed. That knowledge will in fact put an end to the matter, psychologically and scientifically. ADNAN OKTAR: There were at first very few of Darwin’s books 170 years ago; when Lamarck first appeared 160 years ago, his ideas spread like wildfire, but his books were still few in number. And when Darwin first appeared his books were also few in number, but he still influenced the whole world and altered its whole philosophy. Now in the same way, anti-Darwinist works are few in number but have had the same impact and have given rise to a whole anti-Darwinist body. ADNAN OKTAR: For one thing, there are no transitional forms. This is very important. We have exposed Darwinists’ lies. What it says is, ‘Darwin, if species really do descend gradually from other species, why is it we do not encounter innumerable transitional forms?’ There are no intermediate forms. Not a single one has been encountered to date. I have said I will give 10 trillion to anyone bringing me just one transitional form. I have been saying it for months, but nobody has come to my door to collect the money. People are really troubled. There is the economic crisis. I have said I will give 10 trillion, and if anyone had such a fossil they would certainly have showed up with it. But there is not a single intermediate form, just as Darwin predicted. ADNAN OKTAR: (Darwin’s theories) lead to terror and violence. In other words, Hitler’s, Stalin’s and Mao’s ideas all stemmed from Darwin, and these people openly stated that they carried out their activities under the influence of Darwin’s ideas. All the terrorist engaging in conflict in the world are Darwinists. They have all had a Darwinist, materialist education. Close inspection shows that even people who appear to be Muslims are actually Darwinist and socialist in origin. ADNAN OKTAR: For example, Mao said that Chinese communism was entirely based on Darwin and the theory of evolution. Those are Mao’s own words. ... In other words, all the spillers of blood are Darwinist in origin. Karl Marx described Darwin’s book, The Origin of Species, as “the book containing the historical basis of our views.” He means it is the basis of Marxism. In other words, were it not for Darwin’s theories, there would have been no Marxist philosophy, nor Stalinism, nor fascism nor present-day Satanism. That is their origin. There was even Darwinist philosophy in ancient Egypt. They believed that human beings and animals emerged by chance from the mud of the River Nile. The Sumerians also believed in this shamanist, pagan religion. The Sumerians had the same beliefs as Darwin. They thought that human beings, animals and plants came into existence spontaneously from muddy water. This pagan belief of the Sumerians and Darwin is a very backward and heretical one. It has nothing to do with science. Paleontolgy and geology are sciences. Biology is a science. But Darwinism is nonsense. A superstition, a pagan religion. ADNAN OKTAR: Paleontology, geology and physics are all sciences. But this (Darwinism) is a religion. A heretical faith. We need to distinguish between science and a pagan religion. Because Pharaoh in ancient Egypt was interested in science. He claimed that all living things emerged from the mud of the River Nile. Or the ancient Sumerians were the scientists of the times and were interested in science; they claimed that all human beings and animals and plants formed spontaneously in mud. That was the logic. But there is a clear difference between this and science. There is no need to go into that much detail to describe the difference between nonsense and science. That is obvious. Le Nouvel Observateur: A short while back you said the important thing was to be devout. Do you think someone can be devout as well as a Darwinist? ADNAN OKTAR: You would have two faiths. One would believe in a Sumerian religion and also in an Egyptian faith, and Christianity. You would have 2 or 3 religions. But I would not call it atheism. Darwinism is a shamanist religion. Le Nouvel Observateur: So does the present Pope have 2 religions? ADNAN OKTAR: If he also believes in Darwinism then of course he is a member of 2 religions. He believes in Darwinism, a shamanist religion. And he believes in Christianity, I cannot say he has no religion, of course, but he will certainly have two. Le Nouvel Observateur: What do you think of the Vatican’s latest initiative? They are saying the Bible does not conflict with the theory of evolution. ADNAN OKTAR: The Vatican is under pressure. Under ideological pressure. It is under pressure from global Freemasonry and cannot speak freely. Which Christian could espouse such a thing? There is obviously ideological, covert pressure here. Because does a Christian account for the creation of the angels in terms of evolution? No. Does he account for the creation of the djinn through evolution? No. So how can he account for the creation of human beings through evolution? If Allah directly created the angels and djinn, so He directly created human beings. ADNAN OKTAR: But since there is severe pressure on the Pope and the Christians there, Masonic pressure, they are unable to speak freely there. And that is another side, another unpleasant side, of Darwinism. Because Darwinism is also a dictatorial ideology. It is an ideology that imposes itself through duress. It excludes or tries to assimilate those who reject it. ADNAN OKTAR: These ideologies are not under official protection. But Darwinism does enjoy serious official protection in around 95% of the world. State ideologies are based upon Darwinism. The state system is based on it. If Darwinism disappears, so will the state system. From that point of view, the state does all it can to protect that phiolosophy, that idea. But Freemasonry is not a danger to the state. For instance, communism or fascism are not a threat to the state. But when Darwinism goes the whole system will collapse, and there is comprehensive official backing to prevent that happening. Darwinism enjoys official protection. ADNAN OKTAR: There is actually no need for them to be afraid. That will strengthen their systems. But there is such a panic. They are afraid if Darwinism goes their systems will collapse, but that is a very primitive fear. Because no such thing would happen. On the contrary, society will be stronger and happier.... Take the Pope, for example, when the Prophet Jesus (as)returns. The Prophet Jesus (as)will return to Earth in around 20 years’ time. When he returns, will the Pope be able to look him in the eye and say. ‘You are the result of evolution’? No. ADNAN OKTAR: Hazrat Mahdi(as) will come and be Muslims’ leader. And the Prophet Jesus (as) will also appear. He was temporarily raised into the sky. Allah removed him from time and space 2000 years ago. Now, 2000 years later, he will put him back into space and time. He will return in the same clothing and the same body, and will call people to the true path. ADNAN OKTAR: We know from the hadith of the Prophet (saas). We also know from the signs on the Bible. There are many hadith, and I can tell you them if you wish. Whatever I said has happened. Our Prophet (saas) said there would be solar eclipses during two consecutive Ramadans, and that happened. He said the Iran-Iraq War would happen, and it did. He said Afghanistan would be occupied, and it was. He said the waters of the Euphrates would be severed, and they were, by a dam. And he said there would be anarchy and bloodshed in the same place. PKK terror began around the Euphrates. He said there would be lunar and solar eclipses in the month of Ramadan, and that happened, in 1981 and 1982. He said a comet would appear, and that happened in 1986. He said there would be an attack on the Qaaba and blood would be spilled in the Qaaba. That took place in November 1979. He said there would be a sign in the Sun. And we have seen the greatest solar explosion for several centuries. There were solar eclipses in 2 Ramadans, in 1981 and 1982. ADNAN OKTAR: Years ago I said there would be an economic crisis, and now we have one. That is the word of the Prophet (saas). He says it will happen in the time of Hazrat Mahdi (as)and will last for 7 years, the economic crisis. It will last from 2007 to 2014, insha’Allah. ADNAN OKTAR: The theory of evolution is untrue, according to the Qur’an, and to Christians and to Jews. ADNAN OKTAR: Let me give an example. It will be very clear from this. The story of the Prophet Musa’s(as) staff appears in the Torah and the Bible and the Qur’an. When Musa(as)threw his staff down it suddenly turned into a snake. But not through evolution. A normal, living snake appears out of wood. A snake that eats, moves and gives birth suddenly appears. And that is in the Torah, the Bible and the Qur’an. That means there is no such thing as evolution. ... 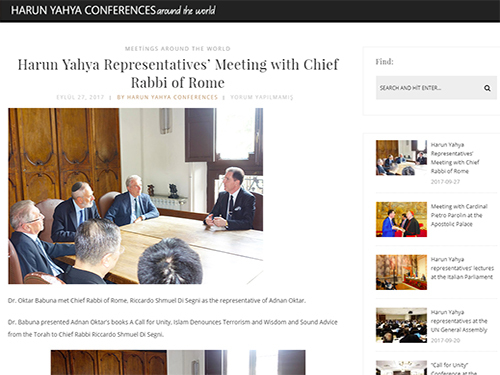 This very clear historic event takes place in three holy scriptures, the Torah, the Bible and the Qur’an. No Christian, Jew or Muslim can deny it, and this miracle happened before the eyes of thousands of people. People were gathered together and it took place right in front of the crowd. ADNAN OKTAR: It (Darwinism) is a wicked lie. Why should people believe that lie? It is a lie that has always led to anarchy. Not even Darwin believed it. How can we believe in the theory when Darwin did not? ... If they espouse evolution, then they are espousing a lie. Because not even Darwin believed it. He says there should be countless transitional forms, so why do we not find innumerable specimens buried in the various strata of the Earth? The man himself describes the collapse of his theory. There are no intermediate fossils, he says. And without them, there is no theory at all. It is now too late for Darwinism. Darwinism is finished. There is no way back. Young people are really alert and intelligent. Young people can no longer be deceived. ADNAN OKTAR: That is irrelevant once people have been told of and understood the invalidity of the idea. What mattered was that people genuinely believed. But no they genuinely do not. They only accepted it because it was imposed on them as a preconception. But nobody really believes in it any more. ADNAN OKTAR: French youth are very alert. I do not think so. If Sarkozy has realized the truth, so will young French people. Because Darwinism is built upon the most ridiculous premise, that of chance. It claims that everything is the result of chance. Which young person is going to believe that? ADNAN OKTAR: He cannot say it openly. ecause there is societal pressure. But in private conversation he will openly admit he does not believe it. One can see this from his words. It is impossible for some with such a faith in Allah to believe in Darwinism. Chance is the most irrelevant and worst idea for any rational person. Chance has nothing to do with the scientific method. Darwinism ascribes everything to chance. We ask how protein formed, and they say by chance. We ask how the cell formed, and they say by chance. We ask how the human eye formed, and they say by chance. How did the human hearing system form? By chance. They account for everything in terms of chance. Can any rational person believe that? Is it possible? No. If they said that spacemen did it, that would be one thing. It is illogical, but at least comprehensible. There is some kind of logic in it. But there is none in Darwinism. Even to put it down to space creatures is baffling. Because one will then ask who created them. But chance is the worst possible explanation one can offer. ADNAN OKTAR: ... But he came in for a lot of pressure after that and no minister has since had the courage to say that. No minister beieves in Darwinism. No minister believing in it emerged throughout the history of the Republic. Ataturk did not believe in Darwinism. Ataturk was a religious man, who believed in Allah... Addressing the nation, he said: ‘There is one Allah. Great is His glory. May the protection, compassion and goodness of Allah be upon you. The basic laws are those in the Holy Qur’an.’ That is a very clear statement. Nobody who believes in the Qur’an can believe in Darwinism. ADNAN OKTAR: Someone who believes in the Qur’an cannot say, at one and the same time, that Allah created and chance also created. They will either say that Allah created, or that chance did. ADNAN OKTAR : But evolution accounts for everything in terms of chance. Religion ascribes it to a conscious being. There is a huge difference between the two. It is one thing to say chance created, and another to say that Allah did so, to say that a conscious being created by means of an intelligent intervention. And it is something entirely different to say that unconscious chaos created. But Darwinists maintain it was unconscious chaos that did the creation. Believers, on the other hand, maintain that creation was done by a conscious power. There is a huge difference between the two. ADNAN OKTAR: Darwinism denies the existence of a conscious entity. It says that chaos did it. It says it all came about as the result of an irrational and unconscious development. Scientists also used to say that chance and chaos did it. But scientists are now realizing this is a huge deception. Because it is impossible for protein to come into being by chance. There is not a single transitional fossil. I have shown there are no transitional form fossils. But there are 100 million fossils that prove the fact of creation. What does a scientist do? He looks at fossils, and if there is no change in them he will say there is no evolution. But if there is a change, he will say that evolution happened. He would have said that had there been a change. But there is not, the fossils are all the same. ADNAN OKTAR: How can you have a theory with no evidence? There is no evidence for Darwinism. Bring me one piece of scientific evidence and I will give you 10 trillion, I said. But they can’t. All they can come up with is chaos and chance. ADNAN OKTAR: For one thing, even a child can see that Darwinism is a terrible deception and lie. A child of 7-8 can see it. We look at the fossils. There has been no change in animals. There are 100 million fossils dating back 80 or 100 million years. Then if we bring in a child of 9, a primary school student or middle school student and ask whether any change has taken place in them, the child will say no. That means there is no Darwinism. There is no need to be a scientist to see that. 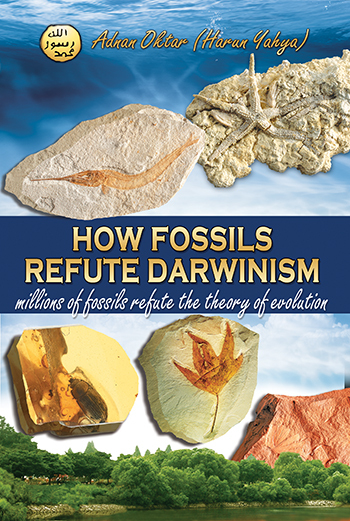 ADNAN OKTAR: But 100 million fossils are a very significant thing. There are 100 million fossils that prove creation. But there is not one fossil to confirm Darwinism. Even a child can understand this great truth. ADNAN OKTAR: They are in the hands of large numbers of collectors, even in Turkey. In Europe and elsewhere. And if we dig the ground up, when we dig it up in Turkey, we keep finding fossils. Every fossil we look at shows there has been no change in the animals. It is not hard to find fossils, they are all over the place in Turkey. Darwin says there must be transitional forms. He says there have to be transitional forms if his theory is right. But none have been found. So his theory has evaporated. ADNAN OKTAR: No, there is a mass psychology. Nobody wants trouble. Nobody wants trouble so they go along with the status quo. A professor will not want to be thrown out of his college, for instance. An associate professor will not want to be expelled from his college. They keep silent and make no trouble. They have to accept the system, and so it goes on. But the truth is you cannot find anyone who believes in Darwinism. Because Darwin himself does not believe in it. ADNAN OKTAR: But it is a very primitive religion. It is a very primitive shamanistic religion. The most primitive religion in the world. The ancient Egyptians had this belief, as well as the ancient Sumerians. It is an ancient Sumerian religion...Darwinism was established to defend atheism. But it fell apart immediately because it was very weak and hollow. ADNAN OKTAR: Of course I fight atheism, but Darwinism is a very perverted and abnormal faith. It is a philosophy constructed on a lie. I show that deception to people. It is a huge deception. ADNAN OKTAR: Jesus will soon return, for instance. The Pope will ask him whether he is the result of evolution. ADNAN OKTAR: All Muslims espouse creation. There are more than 1 billion Muslims in the world who espouse creation. The same goes for Christians and Jews. ADNAN OKTAR: I am the most effective representative. I am even the most effective representative in the history of Islam. ADNAN OKTAR: There has never been such a powerful anti-Darwinist movement since Darwin’s time...Never one that has done such damage and achieved such results. ADNAN OKTAR: In 10 years’ time we will be reading about Darwinism in history books. People will be amazed how they ever believed it. They may even laugh at themselves. ADNAN OKTAR: But states currently espouse it as an official ideology. In other words, it is seriously supported, and nobody opposed to Darwinism is kept on at universities. One cannot openly state that one is opposed to Darwinism. Because it is under global state protection. One cannot underestimate this. The idea of evolution was also the state ideology in the time of Pharaoh. Life emerging from the mud of the Nile was state ideology. It was also the ideology of state in Sumerian times. And it is state ideology today. This is something very important. It is a terrible disgrace the way that a heretical faith has been imposed on people in the 21st century, imposed by anti-democratic methods. ADNAN OKTAR: I have also had it. All my colleagues have. Of course, a researcher will investigate diametrically opposed ideas. Of course I also read Marx’s Das Kapital. I read Mao’s works too. ADNAN OKTAR: No, of course it applies, from what I can see. Because Dawkins regards it as important. He thinks that the only movement opposed to it and that demolishes his ideas comes from Turkey and originates with me, and he is right, of course. That is why he has adopted such a harsh attitude towards me and imagines he is making progress. He is doing things, but nobody has any respect for them. Because the important thing is the scientific method. People act in line with the evidence. Dawkins would not have to go to so much trouble if he could put up any evidence. If he could put some fossils up it would be the end of the matter. But he has no fossils and no evidence. I told him, told everyone, to come up with just one piece of evidence. But they have not come up with a single one, nor can they ever. ADNAN OKTAR: No, I like the Jews very much, because they are descended from the Prophet Ibrahim (as). It is impossible for anyone descended from the prophets to be such a thing. I wrote a book The Genocide Barbarity. Someone else brought out a book called the Holocaust Lie under my name. I took legal action and issued a notarized injunction. I warned that person not to write under my name ever again. It was not a book of mine. 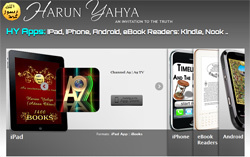 My books appear under the name of Adnan Oktar or Harun Yahya. But that book did not. It was a book brought out using the name of Harun Yahya. So that book does not count. Of course, I have been subjected to various forms of severe pressure because I am opposed to Darwinism and defend the truth. There is a deep state organization in Turkey known as Ergenekon. It has been making my life difficult for years, now. It was they who were responsible for the cocaine plot against me at the Security Department.The Ergenekon deep state organization is Darwinist. It holds materialist, Darwinist beliefs. They have engaged in a serious struggle against me because of my struggle against their religion and beliefs. They many times defamed me in the public eye and conspired against me. They even tried to kill me. Some 9 times. With guns. But they failed. Allah always protected me. They made 9 attempts on my life. But they failed. An armed man was waiting outside my house. I got the police onto him. I can give an example. They were lying in wait, with weapons, in front of a house at another address. It is no means an easy thing to be an anti-Darwinist in Turkey. Le Nouvel Observateur: Has the case in which you were sentenced to 3 years’ imprisonment been concluded? ADNAN OKTAR: It is still going on. I can tell you about it. The court prosecutor said, ‘There is no evidence against the defendants among the evidence gathered by the court.’ He also said that the statements were invalid as they were taken in the absence of a lawyer and under duress. He told the court it had recently ruled on acquittal for 6 of these defendants’ friends, on their basis of the same files and evidence. So you should also acquit Adnan Oktar and the others, he said. But the court still sentenced us to 3 years’ imprisonment. Three female colleagues of mine were also tried on charged of belonging to and leading a criminal organization. The case is still going on. It is now at the Supreme Court. But there is no evidence against any of the defendants. These girls are college and university graduates who have never even set foot inside a police station. ADNAN OKTAR: I am not married. That is my own decision. I am very busy. Turkey is under threat from Ergenekon, much blood is being shed, there is terror all over the world. In such a climate I have to work very hard. ADNAN OKTAR: The Qur’an is a book of morals. A book of morals based on revelation. The Qur’an encourages science, of course, but it does not directly intervene in it. Fourteen hundred years ago, the Qur’an said there is no time. It says there is no time, that time is relative. Science discovered that 1400 years later. It says that matter came into being out of nothing. The Qur’an describes the Big Bang theory. Science discovered that only recently, 1400 years later. The Qur’an says that when the universe, the Earth, was first created it was covered with smoke, covered with steam and smoke. Science has just confirmed that. In that sense the Qur’an is a book that describes realities much more advanced than science. It is impossible for the Qur’an to conflict with science. ADNAN OKTAR: Zero volume is matter of infinite density, matter than effectively does not exist. The universe came into being from matter with zero volume in a matter of moments. In a great explosion. This is a great miracle? What has it got to do with chance? Yes, this is a description of the Big Bang. It came into being from nothing, it says. Before there was any time or space. According to the Big Bang theory, time and space came into being in a moment through a great explosion, before any time or space existed. And the Qur’an says the same thing. ADNAN OKTAR: Yes, Judaism and Freemasonry. I was held in a mental hospital after writing that book. In it I talked about atheist Zionists and Freemasons. Not about Jews, but about atheist Zionists and Freemasons. Atheist Zionism is a concept to which both Muslims and Jews are hostile. It is a heretical belief that sheds blood and produces terror and established deep state organizations alongside the Freemasons. That is what I describe. In other words, Zionism, which does not believe in Allah, and Freemasonry.These two are currently allied to produce terror, bloodshed and anarchy. They also represent a Darwinist structure. ADNAN OKTAR: It is all very painful. It is also very bad for Israelis to kill or be killed. It is the Masons and atheist Zionists who are organizing this. ADNAN OKTAR: Yes, I support the Palestinians and I support the Jews. I support the religious Jews. And the Palestinians, because this system oppresses both sides. ADNAN OKTAR: They are also oppressing religious Christians. ADNAN OKTAR: I am on the side of all wronged people, of all the oppressed. ADNAN OKTAR: Yes, they did it. That is true. All the terrorists were socialist Muslims who had been educated in Europe, who had received a Darwinst education. ADNAN OKTAR: People educated in America or Europe, influenced and directed by the Masons. ADNAN OKTAR: Let me first say that I do not know if there exists any such person. All the people who have been mentioned are people who received a Darwinist and materialist education in America or Europe. They even received CIA training. ADNAN OKTAR: There is no such person. But everyone involved were Darwinists. They had all received a Darwinist education in America or Europe. ADNAN OKTAR: There is no need to list the organization name by name. But they are all former socialists. Because socialists and Stalinists were in power in Iraq, Stalinists were in charge in Syria, and Marxist-Leninist thinking dominated in Palestine. The idea of Islam has only recently re-emerged there. Former socialists and communists and the young people raised by them use acts of terror, and these are all Darwinists and materialists. ADNAN OKTAR: These are virtual organizations, names put forward by the Masons, though such names do not really exist. These names are purely virtual ones. If they really existed, the organization would have a home base, a headquarters. These are false names put forward by deep state organizations. They are false names put up by the Masonic and atheist Zionist deep state, and if they really existed they would be caught straight away. It would be impossible for America, Britain or Europe to lack the means to do that. ADNAN OKTAR: They are all under the control of the Masons. There can be not such force without Masonic backing. That is how the Ergenekon organization appeared. The Ergenekon terror organization in Turkey is under Masonic control. That has been documented. Otherwise they would have no such necessary resources nor technical knowledge. These acts of terror are highly organized. September 11 was highly organized. It was an action perpetrated by Masons and atheist Zionists. It was not something a handful of terrorists could have put together. ADNAN OKTAR: In the same way we work for Allah’s approval and strive for His good pleasure, so they strive for that of satan. They worship satan in the same way we worship Allah. They follow satan’s commands in the same way we perform our religious obligations.’’ Yes, this is a struggle that will last from creation to Doomsday. ... This is an idea put forward by Masons and satan, in other words, a devilish ideology. ADNAN OKTAR: It is of course a devilish idea to encourage Christians and Muslims to fight one another. Christians and Muslims of course believe in the same Allah and are brothers, so why should they fight? They believe in the same prophets. Le Nouvel Observateur: It would be a good thing if you were to spread that message everywhere. ADNAN OKTAR: Of course we spread it on the Internet. In 60 languages. Eighty million copies of my books have been downloaded in one year. ADNAN OKTAR: Muslim countries are not that much aware of the danger. They are not that aware of the danger of Darwinism. ... What matters is the main points of the real danger. France is important. Britain and America are important. Once Darwinism has collapsed there there can be no Darwinism in Islamic countries, nor anywhere in the world. ADNAN OKTAR: The term Adnan Hodja appeared in a magazine headline in 1986, and has remained in use ever since. I do not claim to be a teacher or hodja. I am an ordinary Muslim. I am an ordinary Muslim who loves Islam and the Qur’an, who searches for the truth and who strives for human happiness. ADNAN OKTAR: We are just a group of friends consisting of normal Sunni, Hanafi Muslims. We have no original views. We are Hanafi and Sunni. ADNAN OKTAR: I like the French very much. They are all excellent people, just like you. They are pleasant natured, modern and high quality. But I cannot accept the way such a perverted theory has taken in the French people, and I have told them the truth. They should love Allah as Sarkozy does and have a strong dialogue with Allah; let us all love Allah. Let us live as one in happiness in brotherhood. Let there be no terror or anarchy. ADNAN OKTAR: France is coming out of an age of darkness into an age of enlightenment. The darkness of the last 150 years is being dispelled. ADNAN OKTAR: Of course, these things are happening because the coming of the Messiah (as) is close at hand. Allah creates this as a miracle. The coming of Hazrat Mahdi (as) is close. The coming of the Messiah (as)is close at hand. That is why these things are happening.